We’re not even sure if these can officially be called gnocchi but they’re easy and very tasty. They look pretty awful before they’re cooked and we were a bit worried that they would disintegrate altogether when they hit the water. All was well. Wine Suggestion: These were a superb match with the Sartarelli “Tralivio” Verdicchio we had open which was great. Sartarelli specialise solely in Verdicchio and it shows with a wine of great depth, personality and balance. There is a nuttiness to the aroma and taste which works with the earthy spinach and the balance of fruit complements the ricotta. Put the spinach into a large bowl and pour boiling water over it. Leave for a couple of minutes until wilted, then drain. Leave to cool, then wrap in a clean tea towel. Squeeze out as much water as possible, then finely chop. 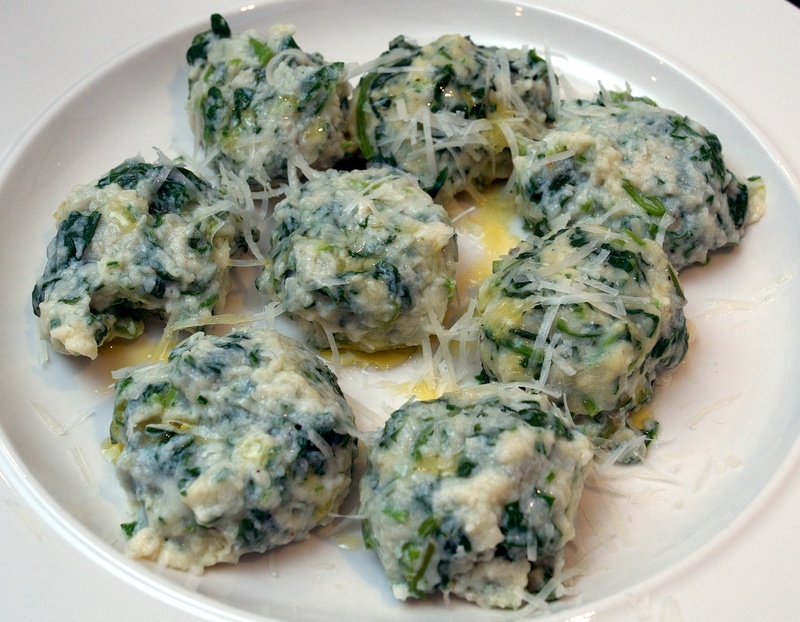 Put the spinach, parsley, garlic, ricotta, flour, eggs, cheese and a generous grating of nutmeg into a large bowl and season. Stir with a fork until completely mixed. Use wet hands to make walnut-size balls. Put the gnocchi on a large plate and put in the fridge for at least 30 minutes. When ready to cook, heat the oven to warm and bring a large pot of water to the boil. Reduce the heat to medium and drop in batches of gnocchi, about 8-10 at a time. They will sink to the bottom at first and when they rise to the top you should cook for another minute, then remove with a slotted spoon and keep warm while you cook the rest. Serve with a drizzle of olive oil, a sprinkle of Parmesan and some rocket.